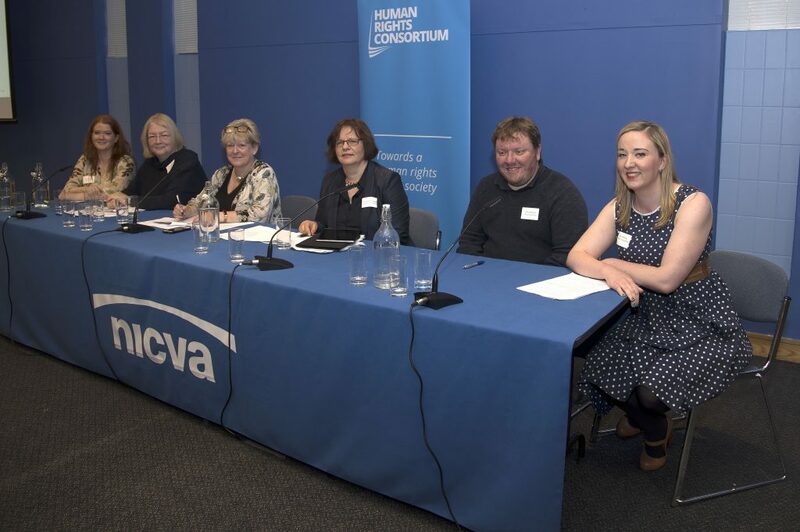 On Thursday, 15th June 2017 the Human Rights Consortium in partnership with NICVA and with sponsorship from Unison hosted a conference to move the Brexit conversation towards a solutions focused civil society engagement. 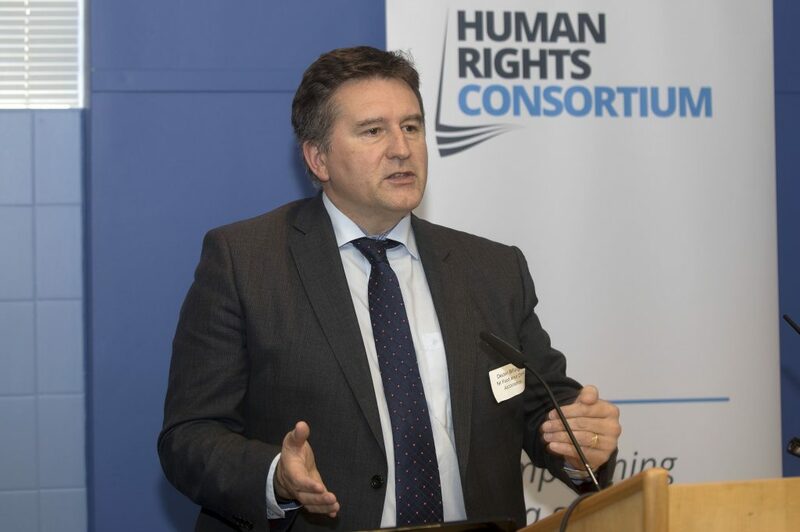 In his welcome, Director of the Consortium Kevin Hanratty, outlined that the purpose of the conference was to bring a broad range of civil society organisations into the one room to try and explore the commonalities between sectors on Brexit. After almost a year of assessing the potential impact of Brexit in Northern Ireland it was now appropriate to move to look at solutions. He acknowledged the changing political landscape in NI and the rest of the UK in the aftermath of the General Election. He emphasised the EU as an underlying confidence building measure of the Belfast/Good Friday Agreement and reiterated that taking a solution focus was essential to ensure that the concerns of NI civil society were heard in Westminster, Dublin and Brussels. The conference was opened by Colette Fitzgerald of the EU Commission in Belfast who very clearly set the scene; Brexit has not happened yet and the EU is ready and waiting for the UK to come to the negotiating table. She also made it clear that the EU Commission does not negotiate with regions and that NI’s voice would be heard via the UK Government. However, she along with colleagues in Scotland, Wales and England report on a daily basis to the EU Commission negotiating team on concerns that were raised with her and her door was always open. 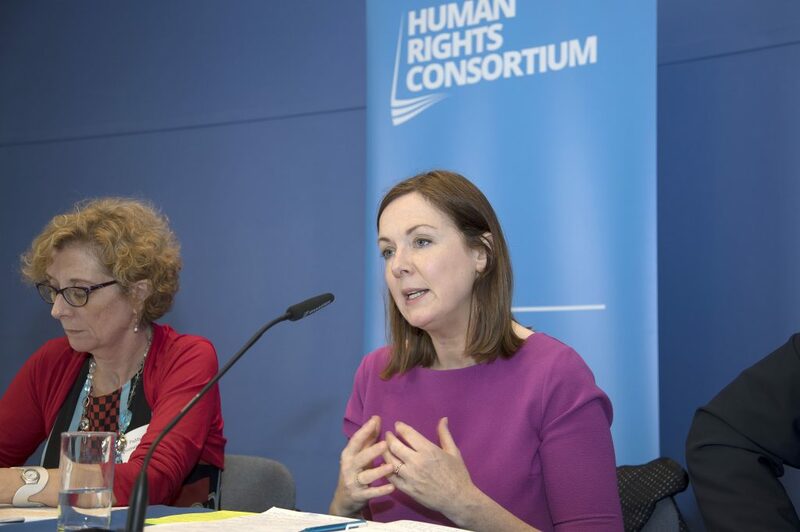 The human rights concerns of Brexit were highlighted by Dr Claire McCann, who identified some of the risks posed by Brexit, such as removal of the extensive framework of rights protections in the EU Charter of Fundamental Rights. 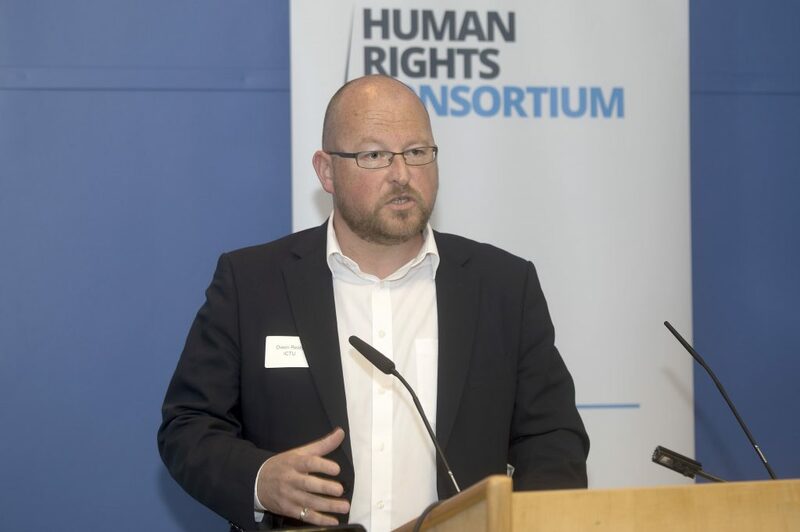 There is a need for a more rights-focused approach to legislating after the UK withdraws from the EU and the outstanding commitment of the Belfast/Good Friday Agreement for a Bill of Rights for NI, which could embrace the range of civil, cultural, economic, political and social rights in the Charter and offer a mechanism to shore up the rights in NI. The first panel was a broad cross cutting panel chaired by Patricia McKeown, Regional Secretary of Unison. First speaker was Professor Dagmar Schiek of Queen’s School of Law, who, in light of the DUP’s increased influence in Whitehall, presented an analysis of the DUP’s manifesto priorities on Brexit. She was concerned that the manifesto presented a ‘circle that could not be squared’. The desire for a frictionless border on the island of Ireland could only be achieved if there was recognition of the unique circumstances of NI, and for NI to remain in the Single Market, the Customs Union and adopt a range of citizen’s rights and EU law. However, this could lead to a change in relations between NI and the rest of the UK, unless the UK was also to take this position. Moreover, a frictionless border on the island of Ireland is incompatible with escaping the jurisdiction of the CJEU in NI, something which is a DUP red line. Professor Schiek addressed the possibility for transitional arrangements for NI in Brexit, but highlighted that it was difficult to find a perfect solution to the complexity of the problem. The second speaker on this panel was Ruth Taillon, Director of Centre for Cross Border Studies who contextualised her discussion in examining what ‘no return to the borders of the past’ means in practice. She focused on the practical issues involved in policing a border which currently has an estimated 23,000 commuters crossing it on a daily basis (and that figure does not include people crossing the border for non-work purposes). She also discussed the limitations of the common travel area, which is not a legal framework and does not create rights for people moving between Ireland and the UK. Both the UK and Irish governments would have to support border communities and additional funding allocations should be derived from the UK’s current contribution to the EU budget, rather than from the block grant. She also raised the possibility of differentiated immigration policies for devolved regions, to recognise the unique needs of NI. The other contributors to this session spoke to the specific concerns of people in NI. 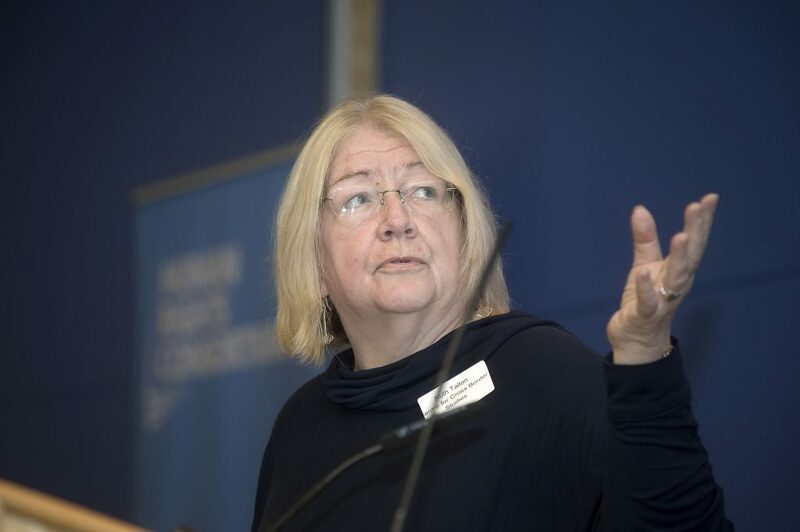 Edel Quinn of Age NI spoke to the issues faced by older people in Brexit, including the economic and political uncertainty in the aftermath of the referendum and the particular concerns about health and social care and pensions. Moving forward, there needs to be better, more useful information for older people, more involvement in decision making and an assurance that the rights of older people are not undermined in the Brexit process. Edel Quinn, Age NI, with Ruth Taillon, Centre for Cross Border Studies, Patricia McKeown, Regional Secretary, UNISON, Professor Dagmar Schiek, QUB, Patrick Malone, Disability Action, and Claire Bradley, Children’s Law Centre. Claire Bradley of the Children’s Law Centre spoke to the specific concerns of children and young people who worry that the Brexit vote has further polarised communities in NI. There is a vast interface between EU law, policy, funding and practice its impact on the lives and rights of children and young people. After the election ‘everything that had been taken off the table is potentially back on the table’ and now the task was to maximise the protection of human rights and children’s rights in NI and to protect the peace process. Patrick Malone of Disability Action spoke to the particular concerns of disabled people and gave a whistlestop tour of EU law protections for people with disabilities, with everything from mobility access, travel, anti-discrimination law and the European health card in play. The EU has been instrumental in advancing rights for people with disabilities in NI. The second panel of the day addressed Rural Affairs and was chaired by Geoff Nuttall, Head of Policy and Public Affairs at NICVA. the first speaker was Professor David Phinnemore of the School of Politics in Queen’s who asserted that there is an unprecedented space for NI to feature in imaginative solutions to Brexit. He highlighted the UK government’s commitment to take account of the particular circumstances of NI and the EU’s desire to find flexible and imaginative solutions for NI. The potential options available for NI depend on the nature of the UK-EU relationship, but even the most comprehensive options of membership of the single market and the customs union does not address agriculture. Any potential solution would require EEA+ and customs union+ so a bespoke deal is required for NI if the agri-food sector is to be covered. The next speaker was Louise Coyle of NI Rural Women’s Network, who began by highlighting the importance of EU funding for rural areas since the 1990s and that 40% of NI population lived in rural areas. There are serious concerns in rural communities about the uncertainty of Brexit and this uncertainty breeds fear for people, communities and business of a negative impact on the economy and people’s lives. The information vacuum surrounding the Brexit impact in rural areas heightens this fear. Some of the key challenges including the lack of a unified Executive position on Brexit, budgets and the Border. She then moved on to looking for opportunities in Brexit and emphasised the need for increased visibility of women in the Brexit process. Engagement with civil society and rural communities in the development of policy and legislation, for example in a Rural Needs Act and NI bespoke rural development programme is necessary. The best way to strengthen human rights in Brexit is with an NI Bill of Rights. The third speaker was Declan Billington, Chair of the Northern Ireland Food and Drink Association, who spoke to the importance of the agri-food sector in NI and the danger of the ‘no deal’ option for the sector. He also made it clear that it is an industry which relies heavily on workers from across the EU who have come to NI to build lives and who are embedded in communities, and their lives and families have now been thrown into uncertainty. He also highlighted the all-island nature of the industry and the need for this to be addressed in any negotiation with the EU, as without a specific deal addressing the agri-food industry would be unable to survive. He also emphasised that EU trade deals are about more than the bottom line of trade and include agreement on environmental standards, human rights and other ‘values’ clauses. The issue for the agri-food business is whether the UK will be able to maintain this or whether a cheaper food policy will mean that NI food production will be out sourced to countries with minimal human rights and welfare standards. For the NI Agri-food industry to survive, special arrangements need to be made to ensure it is viable post-Brexit. Aidan Campbell of the Rural Community Network made it clear that business has the resilience to adapt and move, but it will the people in rural communities who will suffer from any contraction of the rural economy on Brexit and we must focus resources and attention on socially excluded communities and devolve decision making power down to the local level. He made it clear that the EU is flawed and is not sufficiently focused on a social Europe model, but it has still had a positive influence on opening up NI. In order to move things forward it is vital that the issue of the rights of EU migrants is dealt with immediately and to develop a local Rural Development Programme for NI which focuses on the needs of rural communities. Dr Brian Jack of the School of Law in Queen’s highlighted the risk of roll-back on rights and protections as the UK extricates itself from the complex regulatory edifice of environmental law. The risk of losing the CJEU as a regulatory backstop to impose fines was severe. Without the EU acting as a supervisory jurisdiction, NI would need its own environmental regulator, which should have an advisory, investigatory and auditing role, as well as regulation, similar to the Northern Ireland Human Rights Commission’s powers in relation to human rights. 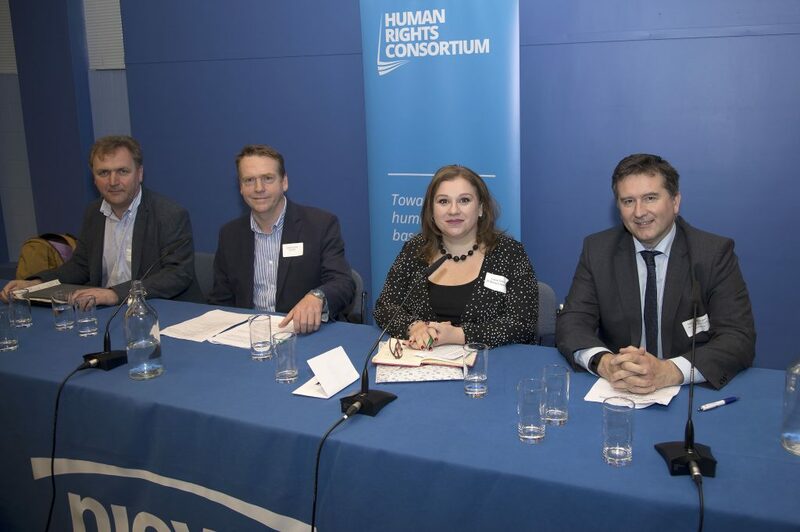 The final panel of the day was focused on business and was chaired by Paddy Kelly of the Children’s Law Centre. The first speaker was Angela McGowan, Director of the CBI who stated that being in the EU had been good for business in NI and the benefits were felt in trade, improved living standards and regional development. The uncertainty caused by the Brexit vote had an immediate impact on business who, rather than making big investment decisions, were delaying until the economic outlook became clearer. Brexit is not just bad for the economy it also risks destabilising the peace process and reinstating borders on the island of Ireland is threatens the peace agreement. 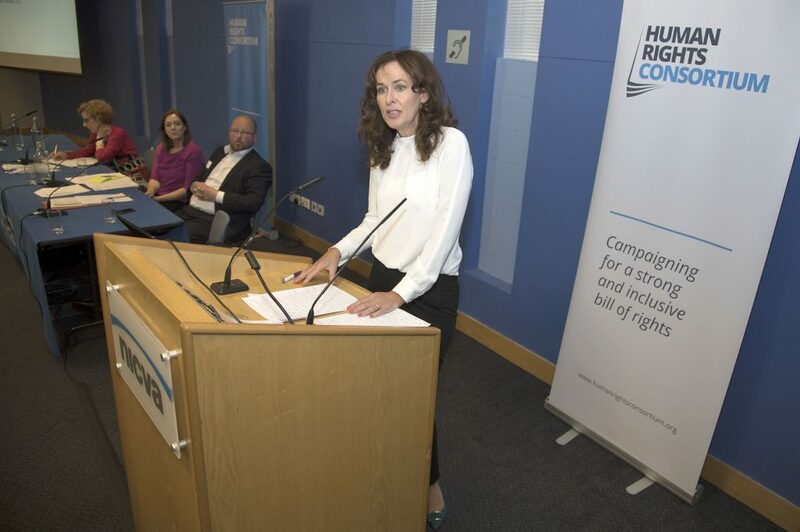 The general election offers the opportunity for a change of tone from the government about the kind of Brexit it wants and for a more positive and open response to the economic, social and human rights risks. The next speaker was Owen Reidy, Assistant General Secretary of NIC-ICTU who emphasised the common ground between business and the Trade Unions and that jobs and trade were two sides of the one coin. The EU had been good for progressing worker’s rights and the Brexit process should not be used as an excuse for a race to the bottom and the (uniquely) devolved powers in relation to employment law should be used by the executive to ensure that NI ensures workers’ rights are protected and enhanced. The democratic legitimacy for a hard Brexit has never been strong and was fatally undermined by the result of the general election and now the options facing the UK government are soft Brexit or no Brexit. Reidy emphasised the uniqueness of NI, especially in relation to Strand 2 of the Belfast/Good Friday Agreement. He finished by echoing Declan Billington that there is no deal that is not worse than the current arrangement and that Brexit was too important to be left to the politicians so it was imperative to have a credible social dialogue – power sharing is not just horizontal, it must be vertical between civil society and politicians. Patrick Yu of the NI Council for Racial Equality addressed the positive impact that migrants have had in NI, both socially and economically and the risk that the uncertainty caused by Brexit could lead to an exodus of migrants from NI. He focused on the how much it costs families to apply for permanent residency and the bureaucracy involved and the need for certainty and a more streamlined process. Fergal McFerran of NUS-USI reminded the room that no one lives one dimensional lives and that students are workers, carers, minorities too and all of the other issues raised by speakers throughout the day, also apply to students. But students also have particular experiences and there are risks to funding of Further and Higher Education, access to programmes, such as Erasmus, and mobility offered by the EU. He used the example of a young person from Donegal who travels daily to the North West Regional College and the need to ensure support for student accessing education across the border. Conor Houston of the Centre for Democracy and Peace Building echoed Angela McGowan in making the link between peace building and prosperity and the need to ensure NI civil society voices are heard. He highlighted the need to engage with the DUP to ensure that they represent the diversity of concerns and potential solutions in Brexit. 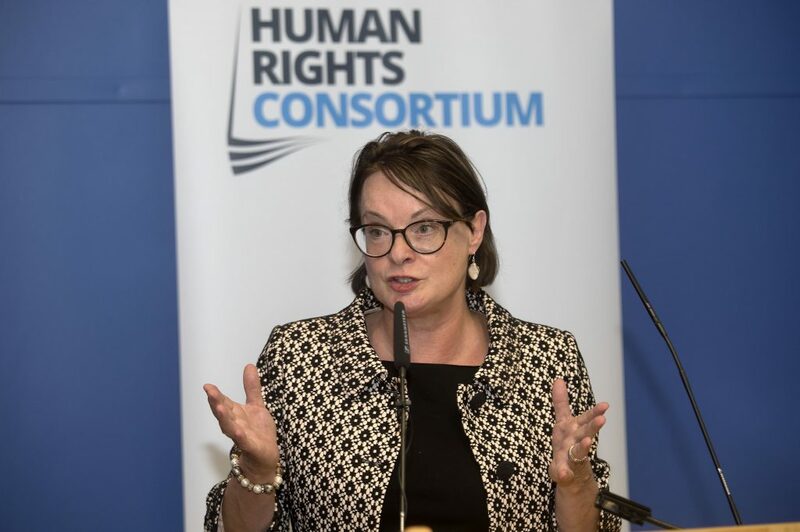 Professor Deirdre Heenan of the University of Ulster brought her own inimitable perspective as rapporteur for the event. It is necessary for civil society to find it’s voice in Brexit and to formulate its demands and events like this are essential for doing that. There are no easy solutions, but it is possible to be creative and find things that can work for NI. The Governments of Wales and Scotland have called on the Minister for Exiting the EU to create a formal process for the devolved administrations to have a voice in the Brexit negotiations and we need to be constructive and build alliances within NI, across the UK, across the island of Ireland and beyond in the EU Commission and EU27. The lack of political leadership in NI is not good enough and we must call on all the parties to find a political consensus. While the border and unique status for NI may be divisive, the economy is not and if we use that as our starting point we can address EU citizenship and rights issues. It is also clear there will need to be unique arrangements for health and social care in NI. The EU has shown good will to NI and they are invested in the peace process, which is reassuring. Professor Heenan’s message is clear: we need to get over it, we are special and we need to use it to our advantage to get the best deal for NI. And with that the conference was brought to a close. For more context on the discussions, check out the presentations below and #chartingbrexit on twitter. A full conference report will be published very soon, together with the key outcomes from the day. Watch this space. Many thanks to all who attended, spoke at or contributed to the conference. Particular thanks to our partners NICVA and UNISON.